Pasta in any form is a great hit with most people. Nimesh, my brother loves his pasta and so this recipe is for him. So Nimesh, hop onto a plane and come down or get Arti to make it for you. Its not too saucy or too dry. Just the way you love your pasta. A very sneaky way to get the kids to eat spinach. There are many ways of making pasta, so I decided to stick to only green vegetables for this one. I just made this last night and it was not enough for both of us. Perhaps Ajay and I were too hungry. Normally 2 cups of pasta is enough for 4 servings. Use any type of pasta you like. 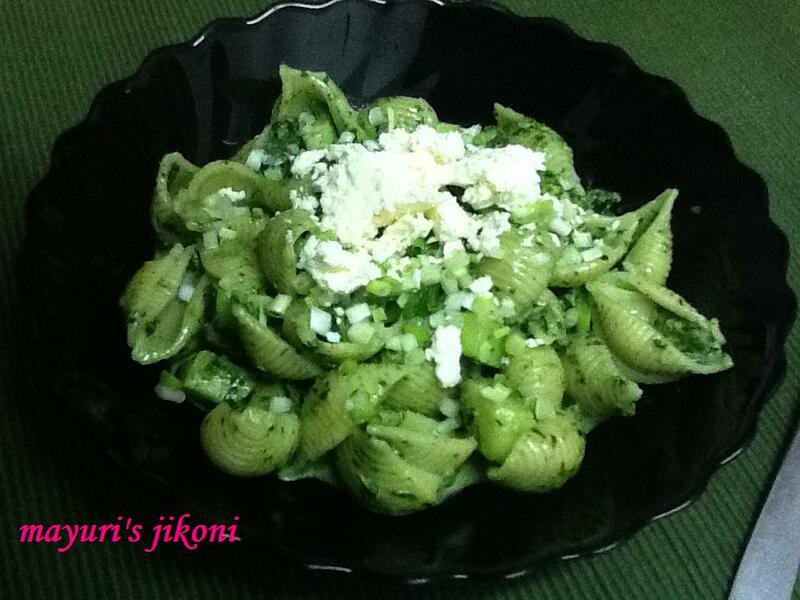 Its amazing how green the pasta turned out as I used fresh spinach. ½ cup of cheese grated or crumbled. Any of your choice. Boil the water in a pan. Add salt, oil and pasta and let it cook till al dente. The cooking time is usually indicated on the packet. When it is done, drain it out into a colander or sieve. Wash under cold water and keep it on the side. Heat the olive oil in a pan. Add the garlic paste and saute till it turns light pink. Add the green chilli paste and the zucchini. Add the salt. Mix well and cover the pan. Let the zucchini cook for 3 to 4 minutes. it should not be overcooked. Add boiled pasta to the zucchini mixture. In the same pan, pour the fresh cream. Let it become hot over medium heat. When it begins to bubble, add the spinach puree. Let it thicken a bit. Switch off the heat. Add pepper and nutmeg powder. Add the pasta mixture and mix well. If you need, add a pinch of salt. Sprinkle your favourite cheese on top. I used feta cheese. Serve with a yummy salad. Can use any cheese… cheddar, feta, mozzarella, parmesan etc. Instead of zucchini only, can use a mixture of zucchini and broccoli or broccoli only. After you add the pasta to the sauce, serve immediately as the pasta will soak up the sauce and make it dry if left for a while. If you need to serve later, leave the pasta and sauce separate. Heat the sauce when required, add the pasta and let it become hot before serving.